CAT-iq (Cordless Advanced Technology - internet and quality) has not been for a prolonged duration but it is already being deemed as the next breakthrough in cordless phones. Initially developed by the DECT Forum, CAT-iq expands on the tried and proven DECT technology, adding a few of its own features to enhance functionality. While highly sophisticated, the concept behind the technology is simple. CAT-iq integrates internet and fixed-line communications by enabling the DECT telephony standard to be incorporated with VoIP and other internet services. The result is superior sound quality along with an array of new features for the devices it is installed on and many perks for the end-user. Innovative features: When connecting cordless telephony to the internet, CAT-iq provides you with access to a number of advanced features such as RSS feeds, public phone books and file streaming - all this directly from the handset. Seamless integration: A CAT-iq certification program helps to ensure that developers using this technology are able to deliver standardized, interoperable products, allowing end-users to enjoy extreme compatibility between all devices integrated with CAT-iq. DECT friendly: Because CAT-iq is based on DECT, a trusted and reliable telephony standard, this technology is able to deliver a guaranteed QoS (Quality of Service), making use of an exclusive frequency band that provides a superior quality of sound free of interference. In order to enjoy this new technology, you will need a high-speed internet connection. This is required to access the next-generation features such as RSS feeds, public phonebooks and audio streaming. To experience communications in wideband audio quality, both you and the other individual must be using a CAT-iq-enabled handset. While several providers are slowly catching on to the technology, Siemens is currently a pioneer in its development. In fact, the telecommunications giant produced the world’s first official CAT-iq cordless phone with its Gigaset S675 IP. Siemens is also leading the charge in the development of more advanced CAT-iq features and services such as online phone books, weather forecasts, RSS feeds and HDSP (High Definition Sound Performance). Already a leader in cordless technology, Siemens is now committed to helping develop this amazing technology and providing consumers with the best in CAT-iq products and services. 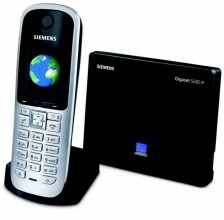 As of now, the CAT-iq technology is implemented into the Siemens Gigaset S675 IP and S685 IP. Both are equipped with HDSP to provide superior wideband audio quality. This entry was posted in General and tagged cordless phones, voip, DECT, Siemens Gigaset, CAT-iq, Cordless Advanced Technology, HDSP, RSS on 27/09/2014 by Craig.